Having your own swimming pools can help you lead a happier life, but did you know that it can also help you lead a much healthier life? Putting a swimming pool in your backyard can do more than make you the envy of the neighborhood. It can do more than guarantee that you always have a fun place to relax in the summer and fall. 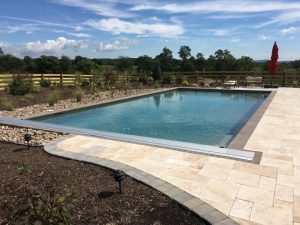 Having your own swimming pools can help you lead a happier life, but did you know that it can also help you lead a much healthier life? While we spend most of the summer slathered in sunscreen, there is a health benefit from being out in the sun. Being in the sun is how our bodies make vitamin D, an important vitamin that many people don’t get enough of; this doesn’t mean that you should be laying out for hours sans sunscreen, of course. But when you’re out maintaining the pool by vacuuming or cleaning, you’re giving your body a chance to make the vitamin D you need. Swimming is a fabulous form of exercise that you can do every day. It works the whole body at one time because you are constantly moving to stay balanced and afloat in the water. Since you’re working your whole body at once, it is also a much more efficient way to tone and strengthen, versus working out with weights or machines. Finally, and for some most importantly, swimming is low stress for joints. Even running can be detrimental to joints over time, but swimming allows you to work your muscles, while your buoyancy in the water eases the effects of gravity. This means that you can also do exercises like water aerobics with less fear of injury. Swimming is good for your body’s joints, and it is also a great way to improve flexibility. Since the water limits the strain caused by gravity, you can stretch and move more freely with less risk of injury. This is why many physical therapy programs include some form of water exercises, whether in swimming pools or not. Doctors recommend exercising for at least 30 minutes a day, 3-5 times per week, to improve or maintain your heart health. Swimming is a great, low-impact way to get your cardio in. Having a swimming pool right in your backyard means that you have no excuse not to get the exercise your body needs. Plus, the pool can be great for relaxing, especially with some fun additions, and exercise improves our brain health and lowers our stress levels too. You may quickly find that you can’t wait to dive in and swim a few laps. Contact Sunrise Premier Pool Builders Today for Your Swimming Pool Accessories! This entry was posted on Friday, October 5th, 2018 at 11:01 am. Both comments and pings are currently closed.